Not to be confused with Occupational medicine. Occupational therapy (OT) is the use of assessment and intervention to develop, recover, or maintain the meaningful activities, or occupations, of individuals, groups, or communities. It is an allied health profession performed by occupational therapists and Occupational Therapy Assistants. OTs often work with people with mental health problems, disabilities, injuries, or impairments. The American Occupational Therapy Association defines an occupational therapist as someone who "helps people across their lifespan participate in the things they want and need to do through the therapeutic use of everyday activities (occupations). Common occupational therapy interventions include helping children with disabilities to participate fully in school and social situations, injury rehabilitation, and providing supports for older adults experiencing physical and cognitive changes." The earliest evidence of using occupations as a method of therapy can be found in ancient times. In c. 100 BCE, Greek physician Asclepiades treated patients with a mental illness humanely using therapeutic baths, massage, exercise, and music. Later, the Roman Celsus prescribed music, travel, conversation and exercise to his patients. However, by medieval times the use of these interventions with people with mental illness was rare, if not nonexistent. In 18th-century Europe, revolutionaries such as Philippe Pinel and Johann Christian Reil reformed the hospital system. Instead of the use of metal chains and restraints, their institutions used rigorous work and leisure activities in the late 18th century. This was the Moral Treatment era, developed in Europe during the Age of Enlightenment, where the roots of occupational therapy lie. Although it was thriving in Europe, interest in the reform movement fluctuated in the United States throughout the 19th century. It re-emerged in the early decades of the 20th century as Occupational Therapy. The Arts and Crafts movement that took place between 1860 and 1910 also impacted occupational therapy. In the US, a recently industrialized country, the arts and crafts societies emerged against the monotony and lost autonomy of factory work. Arts and crafts were used as a way of promoting learning through doing, provided a creative outlet, and served as a way to avoid boredom during long hospital stays. Eleanor Clarke Slagle (1870-1942) is considered to be the “mother” of occupational therapy. Slagle, who was one of the founding members of the National Society for the Promotion of Occupational Therapy (NSPOT), proposed habit training as a primary occupational therapy model of treatment. Based on the philosophy that engagement in meaningful routines shape a person's wellbeing, habit training focused on creating structure and balance between work, rest and leisure. Although habit training was initially developed to treat individuals with mental health conditions, its basic tenets are apparent in modern treatment models that are utilized across a wide scope of client populations. Occupational therapy. 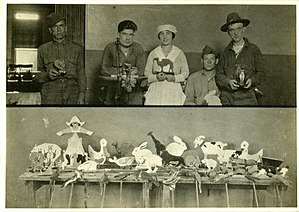 Toy making in psychiatric hospital. World War 1 era. The health profession of occupational therapy was conceived in the early 1910s as a reflection of the Progressive Era. Early professionals merged highly valued ideals, such as having a strong work ethic and the importance of crafting with one's own hands with scientific and medical principles. The National Society for the Promotion of Occupational Therapy (NSPOT), now called the American Occupational Therapy Association (AOTA), was founded in 1917 and the profession of Occupational Therapy was officially named in 1921. William Rush Dunton, one of the founders of NSPOT and visionary figure in the first decades of the profession struggled with "the cumbersomeness of the term occupational therapy", as it lacked the "exactness of meaning which is possessed by scientific terms". Other titles such as "work-cure","ergo therapy"(ergo being the greek root for "work"), and "creative occupations" were discussed as substitutes, but ultimately, none possessed the broad meaning that the practice of occupational therapy demanded in order to capture the many forms of treatment that existed from the beginning. 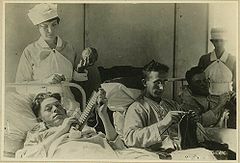 Occupational therapy during WWI: bedridden wounded are knitting. The emergence of occupational therapy challenged the views of mainstream scientific medicine. Instead of focusing purely on the medical model, occupational therapists argued that a complex combination of social, economic, and biological reasons cause dysfunction. Principles and techniques were borrowed from many disciplines—including but not limited to physical therapy, nursing, psychiatry, rehabilitation, self-help, orthopedics, and social work—to enrich the profession's scope. Between 1900 and 1930, the founders defined the realm of practice and developed supporting theories. By the early 1930s, AOTA had established educational guidelines and accreditation procedures. The early twentieth century was a time in which the rising incidence of disability related to industrial accidents, tuberculosis, World War I, and mental illness brought about an increasing social awareness of the issues involved. The entry of the United States into World War I was also a crucial event in the history of the profession. Up until this time, occupational therapy had been concerned primarily with the treatment of people with mental illness. However, U.S. involvement in the Great War and the escalating numbers of injured and disabled soldiers presented a daunting challenge to those in command. The military enlisted the assistance of NSPOT to recruit and train over 1,200 "reconstruction aides" to help with the rehabilitation of those wounded in the war. With entry into World War II and the ensuing skyrocketing demand for occupational therapists to treat those injured in the war, the field of occupational therapy underwent dramatic growth and change. Occupational therapists needed to be skilled not only in the use of constructive activities such as crafts, but also increasingly in the use of activities of daily living. There was a struggle to keep people in the profession during the post-war years. Emphasis shifted from the altruistic war-time mentality to the financial, professional, and personal satisfaction that comes with being a therapist. To make the profession more appealing, practice was standardized, as was the curriculum. Entry and exit criteria were established, and the American Occupational Therapy Association advocated for steady employment, decent wages, and fair working conditions. Via these methods, occupational therapy sought and obtained medical legitimacy in the 1920s. The 1920s and 1930s were a time of establishing standards of education and laying the foundation of the profession and its organization. Eleanor Clarke Slagle proposed a 12-month course of training in 1922, and these standards were adopted in 1923. Educational standards were expanded to a total training time of 18-months in 1930 to place the requirements for professional entry on par with those of other professions. The first textbook was published in United States for occupational therapy in 1947, edited by Helen S. Willard and Clare S. Spackman. The profession continued to grow and redefine itself in the 1950s. The profession also began to assess the potential for the use of trained assistants in the attempt to address the ongoing shortage of qualified therapists, and educational standards for occupational therapy assistants were implemented in 1960. The 1960s and 1970s were a time of ongoing change and growth for the profession as it struggled to incorporate new knowledge and cope with the recent and rapid growth of the profession in the previous decades. New developments in the areas of neurobehavioral research led to new conceptualizations and new treatment approaches, possibly the most groundbreaking being the sensory integrative approach developed by A. Jean Ayers. The profession has continued to grow and expand its scope and settings of practice. Occupational science, the study of occupation, was created in 1989 as a tool for providing evidence-based research to support and advance the practice of occupational therapy, as well as offer a basic science to study topics surrounding "occupation". In addition, occupational therapy practitioner's roles have expanded to include political advocacy (from a grassroots base to higher legislation); for example, in 2010 PL 111-148 titled the Patient Protection and Affordable Care Act had a habilitation clause that was passed in large part due to AOTA's political efforts as noted in AOTA's Centennial website (AOTA, 2017) at http://www.otcentennial.org/events/2010. Furthermore, occupational therapy practitioners have been striving personally and professionally toward concepts of occupational justice and other human rights issues that have both local and global impacts. The World Federation of Occupational Therapist's Resource Centre has many position statements on occupational therapy's roles regarding their participation in human rights issues at http://www.wfot.org/ResourceCentre.aspx. The philosophy of occupational therapy has evolved over the history of the profession. The philosophy articulated by the founders owed much to the ideals of romanticism, pragmatism and humanism, which are collectively considered the fundamental ideologies of the past century. One of the most widely cited early papers about the philosophy of occupational therapy was presented by Adolf Meyer, a psychiatrist who had emigrated to the United States from Switzerland in the late 19th century and who was invited to present his views to a gathering of the new Occupational Therapy Society in 1922. At the time, Dr. Meyer was one of the leading psychiatrists in the United States and head of the new psychiatry department and Phipps Clinic at Johns Hopkins University in Baltimore, Maryland. Occupation has a positive effect on health and well-being. Occupation creates structure and organizes time. Occupation brings meaning to life, culturally and personally. Occupations are individual. People value different occupations. These assumptions have been developed over time and are the basis of the values that underpin the Codes of Ethics issued by the national associations. The relevance of occupation to health and well-being remains the central theme. In the 1950s, criticism from medicine and the multitude of disabled World War II veterans resulted in the emergence of a more reductionistic philosophy. While this approach led to developments in technical knowledge about occupational performance, clinicians became increasingly disillusioned and re-considered these beliefs. As a result, client centeredness and occupation have re-emerged as dominant themes in the profession. Over the past century, the underlying philosophy of occupational therapy has evolved from being a diversion from illness, to treatment, to enablement through meaningful occupation. Three commonly mentioned philosophical precepts of occupational therapy are that occupation is necessary for health, that its theories are based on holism and that its central components are people, their occupations (activities), and the environments in which those activities take place. However, there have been some dissenting voices. Mocellin, in particular, advocated abandoning the notion of health through occupation as he proclaimed it obsolete in the modern world. As well, he questioned the appropriateness of advocating holism when practice rarely supports it. Some values formulated by the American Occupational Therapy Association have been critiqued as being therapist-centric and do not reflect the modern reality of multicultural practice. In recent times occupational therapy practitioners have challenged themselves to think more broadly about the potential scope of the profession, and expanded it to include working with groups experiencing occupational injustice stemming from sources other than disability. Examples of new and emerging practice areas would include therapists working with refugees, children experiencing obesity, and people experiencing homelessness. An occupational therapist works systematically with a client through a sequence of actions called the occupational therapy process. There are several versions of this process as described by numerous scholars. All practice frameworks include the components of evaluation (or assessment), intervention, and outcomes.This process provides a framework through which occupational therapists assist and contribute to promoting health and ensures structure and consistency among therapists. The Occupational Therapy Practice Framework (OTPF) is the core competency of occupational therapy in the United States.The OPTF framework is divided into two sections: domain and process. The domain includes environment, client factors, such as the individual's motivation, health status, and status of performing occupational tasks. The domain looks at the contextual picture to help the occupational therapist understand how to diagnose and treat the patient. The process is the actions taken by the therapist to implement a plan and strategy to treat the patient. The Canadian Model of Client Centered Enablement (CMCE) embraces occupational enablement as the core competency of occupational therapy and the Canadian Practice Process Framework (CPPF) as the core process of occupational enablement in Canada.The Canadian Practice Process Framework (CPPF) has eight action points and three contextual element which are: set the stage, evaluate, agree on objective plan, implement plan, monitor/modify, and evaluate outcome. A central element of this process model is the focus on identifying both client and therapists strengths and resources prior to developing the outcomes and action plan. The OTPF-3 defines ADLs as daily activities that are required to take care of one’s self and body, which are instrumental to one’s health, well-being, and social participation. Examples of ADL’s include: bathing, showering, toileting and toilet hygiene, dressing, swallowing/eating, feeding, functional mobility, personal hygiene and grooming, and sexual activity. The OTPF-3 defines IADLs as daily activities that “support daily life within the home and community that often require more complex interactions than those used in ADLs”. The OTPF-3 defines rest and sleep as “activities related to obtaining restorative rest and sleep to support healthy, active engagement in other occupations”. The OTPF-3 defines education as the activities that are needed to support one's learning, participation, and accessibility within an educational environment. Examples of education include: formal education participation, informal personal education needs or interests exploration (beyond formal education), and informal personal education participation. The OTPF-3 cites Mosey (1996, pg. 423) as how an individual selects work opportunities by their likes, dislikes, possible limitations, and assets. The OTPF-3 defines this aspect of work as how an individual carries out their job. Examples given are: the way in which a person carries out their job requirements i.e. work skills, work patterns, time management, interactions and relationships with coworkers/managers/customers, supervision, production, initiation, etc. The OTPF-3 defines this aspect of work as how an individual adjusts to their new role that includes a vocational interests and opportunities. The opportunity for individuals to develop and enhance interests and skills. The OTPF-3 defines this aspect of play as the individual’s participation in the selected method of play. How an individual is able to balance play with their other occupations. This area also addresses how a person gathers the necessary components for play and uses the equipment appropriately. The OTPF-3 identifies this aspect of leisure as the individual’s identification of interests, skills, opportunities, and activities that are appropriate. The OTPF-3 identifies this aspect of leisure as the individuals activity in planning, and participating in leisure activities that are appropriate. The capacity to maintain a balance between leisure and other occupation as well as using the equipment necessary appropriately. The OTPF-3 defines this aspect of social participation as successful interaction through engagement in activities with a group (i.e. neighborhood, workplace, school, religious or spiritual group). The OTPF-3 cites Mosey (1996 p. 340) and defines this aspect of social participation as successful interaction within a familial role. The OTPF-3 defines this aspect of social participation as the distinctive levels of interaction and closeness which can include engagement in desired sexual activity. According to the 2015 Salary and Workforce Survey by the American Occupational Therapy Association, occupational therapists work in a wide-variety of practice settings including: hospitals (26.6%), schools (19.9%), long term care facilities/skilled nursing facilities (19.2%), free-standing outpatient (10.7%), home health (6.8%), academia (6.1%), early intervention (4.6%), mental health (2.4%), community (2), and other (15%). Recently, there is a trend of OTs moving towards working in the hospital setting and in the long-term care facilities/skilled nursing facilities setting, comprising 46% of the OT workforce. The Canadian Institute for Health Information (CIHI) found that between 2006-2010 nearly half (45.6%) of occupational therapists worked in hospitals, 31.8% worked in the community, and 11.4% worked in a professional practice. The broad spectrum of OT practice makes it difficult to categorize the areas of practice, especially considering the differing health care systems globally. In this section, the categorization from the American Occupational Therapy Association is used. Occupational therapists work with infants, toddlers, children, and youth and their families in a variety of settings including schools, clinics, and homes. Occupational therapists assist children and their caregivers to build skills that enable them to participate in meaningful occupations. These occupations may include: feeding, playing, socializing, and attending school. Mental health and the moral treatment era have been recognized as the root of occupational therapy. According to the World Health Organization, mental illness is one of the fastest growing forms of disability. OTs focus on prevention and treatment of mental illness in all populations. In the U.S., military personnel and veterans are populations that can benefit from occupational therapy, but currently this is an under served practice area. Mental health illnesses that may require occupational therapy include schizophrenia and other psychotic disorders, depressive disorders, anxiety disorders, eating disorders, trauma- and stressor-related disorders (e.g. post traumatic stress disorder or acute stress disorder), obsessive-compulsive and related disorders such as hoarding, and neurodevelopmental disorders such as autism spectrum disorder, attention deficit/hyperactivity disorder and learning disorders. Occupational therapists work with older adults to maintain independence, participate in meaningful activities, and live fulfilling lives. Some examples of areas that occupational therapists address with older adults are driving, aging in place, low vision, and dementia or Alzheimer's Disease (AD). When addressing driving, driver evaluations are administered to determine if drivers are safe behind the wheel. To enable independence of older adults at home, occupational therapists perform falls risk assessments, assess clients functioning in their homes, and recommend specific home modifications. When addressing low vision, occupational therapists modify tasks and the environment. While working with individuals with AD, occupational therapists focus on maintaining quality of life, ensuring safety, and promoting independence. Visual impairment is one of the top 10 disabilities among American adults. Occupational therapists work with other professions, such as optometrists, ophthalmologists, and certified low vision therapists, to maximize the independence of persons with a visual impairment by using their remaining vision as efficiently as possible. AOTA’s promotional goal of “Living Life to Its Fullest” speaks to who people are and learning about what they want to do, particularly when promoting the participation in meaningful activities, regardless of a visual impairment. Populations that may benefit from occupational therapy includes older adults, persons with traumatic brain injury, adults with potential to return to driving, and children with visual impairments. Visual impairments addressed by occupational therapists may be characterized into 2 types including low vision or a neurological visual impairment. An example of a neurological impairment is a cortical visual impairment (CVI) which is defined as “...abnormal or inefficient vision resulting from a problem or disorder affecting the parts of brain that provide sight”. The following section will discuss the role of occupational therapy when working with the visually impaired. Occupational therapy for older adults with low vision includes task analysis, environmental evaluation, and modification of tasks or the environment as needed. Many occupational therapy practitioners work closely with optometrists and ophthalmologists to address visual deficits in acuity, visual field, and eye movement in people with traumatic brain injury, including providing education on compensatory strategies to complete daily tasks safely and efficiently. Adults with a stable visual impairment may benefit from occupational therapy for the provision of a driving assessment and an evaluation of the potential to return to driving. Lastly, occupational therapy practitioners enable children with visual impairments to complete self care tasks and participate in classroom activities using compensatory strategies. Because of the rising need for occupational therapists in the U.S., many facilities are opting for travel occupational therapists—who are willing to travel, often out of state, to work temporarily in a facility. Assignments can range from 8 weeks to 9 months, but typically last 13–26 weeks in length. Most commonly (43%), travel occupational therapists enter the industry between the ages of 21–30. Occupational therapists work with clients who have had an injury and are returning to work. OTs perform assessments to simulate work tasks in order to determine best matches for work, accommodations needed at work, or the level of disability. Work conditioning and work hardening are interventions used to restore job skills that may have changed due to an illness or injury. Occupational therapists can also prevent work related injuries through ergonomics and on site work evaluations. As occupational therapy (OT) has grown and developed, community based practice has blossomed from an emerging area of practice to a fundamental part of occupational therapy practice (Scaffa & Reitz, 2013). Community based practice allows for OTs to work with clients and other stakeholders such as families, schools, employers, agencies, service providers, stores, day treatment and day care and others who may influence the degree of success the client will have in participating. It also allows the therapist to see what is actually happening in the context and design interventions relevant to what might support the client in participating and what is impeding her or him from participating. Community-based practice crosses all of the categories within which OTs practice from physical to cognitive, mental health to spiritual, all types of clients may be seen in community based settings. The role of the OT also may vary, from advocate to consultant, direct care provider to program designer, adjunctive services to therapeutic leader. Occupational imbalance: The limited participation in a meaningful occupation brought about by another role in a different occupation. This can be seen in the situation of a caregiver of a person with disability who also has to fulfill other roles such as being a parent to other children, a student or a worker. Worldwide, there is a range of qualifications required to practice occupational therapy. Requirements can range from a bachelor’s degree (e.g. Australia), a master’s degree (e.g. Canada) and more recently an Occupational therapy doctorate (OTD) is becoming more common (e.g. United states). Additionally, in the United States, there is also an option to become a certified occupational therapy assistant (COTA), which can be achieved from completing an associates degree from an accredited educational program. It can be noted that the educational requirement to have a doctoral degree for practice in occupational therapy is not required until 2027 in the United States, and practitioners with a lesser degree achieved before 2027 will be grandfathered into practice. In conjunction with the educational component of occupational therapy education, there exists a fieldwork component for all educational programs which is a requirement to achieve a degree in OT. All OT education program include periods of clinical education and fieldwork practicing with evaluation and treatment of clients in various clinical settings. Some examples of fieldwork experience include but are not limited to working with stroke patients in rehabilitation hospitals, developmental treatment with children in the community, working with olders adults with dementia in skilled nursing homes, and mental health settings. The profession of occupational therapy is based on a wide theoretical and evidence based background. The OT curriculum focuses on the theoretical basis of occupation through multiple facets of science, including occupational science, anatomy, physiology, biomechanics, and neurology. In addition, this scientific foundation is integrated with knowledge from psychology, sociology and more. All of the educational programmes around the world need to meet the minimum standard of the World Federation of Occupational Therapy (WFOT). The WFOT concerns that occupational therapists will have access to further professional education, higher degrees and post professional training. Occupational therapists are also participating in research in various areas of practice. In the United States, Canada and other countries around the world, there is a licensure requirement. In order to obtain OT license, the Occupational therapists need to graduate from an accredited OT educational program, complete their fieldwork requirements and to apply and pass national certification examination. Generic models are the overarching title given to a collation of compatible knowledge, research and theories that form conceptual practice. More generally they are defined as "those aspects which influence our perceptions, decisions and practice". The Person Environment Occupation Performance model (PEOP) was originally published in 1991 (Charles Christiansen & M. Carolyn Baum) and describes an individual's performance based on four elements including: environment, person, performance and occupation. The model focuses on the interplay of these components and how this interaction works to inhibit or promote successful engagement in occupation. MOHO was first published in 1980. It explains how people select, organise and undertake occupations within their environment. The model is supported with evidence generated over thirty years and has been successfully applied throughout the world. The OPM(A) was conceptualized in 1986 with its current form launched in 2006. The OPM(A) illustrates the complexity of occupational performance, the scope of occupational therapy practice, and provides a framework for occupational therapy education. Frames of reference are so called as they are an additional knowledge base for the Occupational Therapist to develop their treatment and/or assessment of a patient or client group. Though there are conceptual models (listed above) that allow the therapist to conceptualise the Occupational Roles of the patient, it is often important to use further reference to embed Clinical Reasoning. Therefore, many Occupational Therapists (OTs) will use additional Frames of Reference to both assess and then develop therapy goals for their patients and/or service users. The Biomechanical Frame of Reference is primarily concerned with motion during occupation. It is used with individuals who experience limitations in movement, inadequate muscle strength or loss of endurance in occupations. The Frame of Reference was not originally compiled by Occupational Therapists, and therapists should translate it to the Occupational Therapy perspective, to avoid the risk of movement or exercise becoming the main focus. This Frame of Reference is developed from the work of Carl Rogers. It views the client as the center of all therapeutic activity, and the client's needs and goals direct the delivery of the Occupational Therapy Process. Sensory Integration: Sensory integration: Sensory integration framework is commonly implemented in clinical, community, and school-based occupational therapy practice. It is most frequently used with children with developmental delays and developmental disabilities such as autism spectrum disorder and dyspraxia. Core features of sensory integration in treatment include providing opportunities for the client to experience and integrate feedback using multiple sensory systems, providing therapeutic challenges to the client’s skills, integrating the client’s interests into therapy, organizing of the environment to support the client’s engagement, facilitating a physically safe and emotionally supportive environment, modifying activities to support the client’s strengths and weaknesses, and creating sensory opportunities within the context of play to develop intrinsic motivation. While sensory integration is traditionally implemented in pediatric practice, there is emerging evidence for the benefits of sensory integration strategies for adults. The International Classification of Functioning, Disability and Health (ICF) is a framework to measure health and ability by illustrating how these components impact one's function. This relates very closely to the Occupational Therapy Practice Framework, as it is stated that "the profession's core beliefs are in the positive relationship between occupation and health and its view of people as occupational beings". The ICF is built into the 2nd edition of the practice framework. Activities and participation examples from the ICF overlap Areas of Occupation, Performance Skills, and Performance Patterns in the framework. The ICF also includes contextual factors (environmental and personal factors) that relate to the framework's context. In addition, body functions and structures classified within the ICF help describe the client factors described in the Occupational Therapy Practice Framework. Further exploration of the relationship between occupational therapy and the components of the ICIDH-2 (revision of the original International Classification of Impairments, Disabilities, and Handicaps (ICIDH), which later became the ICF) was conducted by McLaughlin Gray. It is noted in the literature that occupational therapists should use specific occupational therapy vocabulary along with the ICF in order to ensure correct communication about specific concepts. The ICF might lack certain categories to describe what occupational therapists need to communicate to clients and colleagues. It also may not be possible to exactly match the connotations of the ICF categories to occupational therapy terms. The ICF is not an assessment and specialized occupational therapy terminology should not be replaced with ICF terminology. The ICF is an overarching framework for current therapy practices. ^ "What is Occupational Therapy". Canadian Association of Occupational Therapists | Association canadienne des ergothérapeutes. Retrieved 2017-05-24. ^ "About Occupational Therapy". American Occupational Therapy Association. Retrieved 2017-05-24. ^ "WFOT | Education | Entry level Educational Programmes WFOT Approved". World Federation of Occupational Therapists. Retrieved 2017-05-24. ^ Peloquin, S. M. (1 August 1989). "Moral Treatment: Contexts Considered". American Journal of Occupational Therapy. 43 (8): 537–544. doi:10.5014/ajot.43.8.537. ^ Peloquin, S. M. (1 November 2005). "Embracing Our Ethos, Reclaiming Our Heart". American Journal of Occupational Therapy. 59 (6): 611–625. doi:10.5014/ajot.59.6.611. PMID 16363178. ^ "Eleanor Clarke Slagle Lectureship Award Recipients". www.aota.org. Retrieved 2018-07-28. ^ "AOTA". www.aota.org. Retrieved 2018-07-25. ^ a b c d Gordon, Don (2009). Willard & Spackman's Occupational Therapy. Baltimore, MD: Lippincott Williams & Wilkins. p. 210. ISBN 978-0-7817-6004-1. ^ Colman, W. (1 January 1992). "Maintaining Autonomy: The Struggle Between Occupational Therapy and Physical Medicine". American Journal of Occupational Therapy. 46 (1): 63–70. doi:10.5014/ajot.46.1.63. ^ Yerxa, E., Clark, F., Jackson, J., Pierce, D., & Zemke, R. (1989). An introduction to occupational science, A foundation for occupational therapy in the 21st century. Haworth Press. ^ Hocking, Clare; Whiteford, Gail (27 August 2010). "Multiculturalism in occupational therapy: A time for reflection on core values". Australian Occupational Therapy Journal. 42 (4): 172–175. doi:10.1111/j.1440-1630.1995.tb01333.x. ^ Breines, Estelle (27 August 2010). "Genesis of Occupation: A Philosophical Model for Therapy and Theory". Australian Occupational Therapy Journal. 37 (1): 45–49. doi:10.1111/j.1440-1630.1990.tb01229.x. ^ Yerxa, E J (1983). Audacious values: the energy source for occupational therapy practice in G. Kielhofner (1983) Health though occupation: Theory and practice in occupational therapy. Philadelphia, FA Davis. ^ McColl, M A, Law, M., Stewart D., Doubt, L., Pollack, N and Krupa, T (2003). Theoretical basis of occupational therapy (2nd Ed). New Jersey, SLACK Incorporated. ^ Chapparo, C. and Ranka. J. (2000). Clinical reasoning in occupational therapy in Higgs J and Jones M (2000) Clinical reasoning in the health professions. 2nd ed. Oxford, Butterworth Heinemann Ltd.
^ Meyer, A (1922). The philosophy of occupation therapy. Archives of Occupational Therapy, 1, 1–10. ^ Christiansen, Charles (July 2007). "Adolf Meyer Revisited: Connections between Lifestyles, Resilience and Illness". Journal of Occupational Science. 14 (2): 63–76. doi:10.1080/14427591.2007.9686586. ^ a b c d e Elizabeth A. Townsend; Helene J. Polatajko (2007). Enabling Occupation II: Advancing an Occupational Therapy Vision for Health, Well-being, & Justice Through Occupation. Canadian Association of Occupational Therapists. ISBN 978-1-895437-76-8. ^ Turner, A. (2002). History and Philosophy of Occupational Therapy in Turner, A., Foster, M. and Johnson, S. (eds) Occupational Therapy and Physical Dysfunction, Principles, Skills and Practice. 5th Edition. Edinburgh, Churchill Livingstone, 3–24..
^ Punwar, A.J. (1994). Philosophy of Occupational Therapy in Occupational Therapy, Principles and practice. 2nd Ed. Williams and Wilkins, Baltimore, 7–20. ^ Douglas, Fiona M (5 November 2016). "Occupation Still Matters: A Tribute to a Pioneer". British Journal of Occupational Therapy. 67 (6): 239. doi:10.1177/030802260406700601. ^ Whiteford, Gail; Fossey, Ellie (March 2002). "Occupation: The essential nexus between philosophy, theory and practice". Australian Occupational Therapy Journal. 49 (1): 1–2. doi:10.1046/j.0045-0766.2002.00317.x. ^ Polatajko, Helene (22 April 2016). "The Evolution of Our Occupational Perspective: The Journey from Diversion through Therapeutic Use to Enablement". Canadian Journal of Occupational Therapy. 68 (4): 203–207. doi:10.1177/000841740106800401. PMID 11680914. ^ Mocellin, George (5 November 2016). "A Perspective on the Principles and Practice of Occupational Therapy". British Journal of Occupational Therapy. 51 (1): 4–7. doi:10.1177/030802268805100103. ^ Mocellin, George (5 November 2016). "Occupational Therapy: A Critical Overview, Part 1". British Journal of Occupational Therapy. 58 (12): 502–506. doi:10.1177/030802269505801202. ^ Mocellin, George (5 November 2016). "Occupational Therapy: A Critical Overview, Part 2". British Journal of Occupational Therapy. 59 (1): 11–16. doi:10.1177/030802269605900104. ^ Kielhofner, G. (1997). Conceptual Foundations of Occupational Therapy. 2nd Ed. Philadelphia, F.A. Davis. ^ Hocking, C and Whiteford, G (1995). Multiculturalism in occupational therapy: A time for reflection on core values. Australian Occupational Therapy Journal, 42(4), 172–175. ^ Iwama, M. (1 September 2003). "Toward Culturally Relevant Epistemologies in Occupational Therapy". American Journal of Occupational Therapy. 57 (5): 582–588. doi:10.5014/ajot.57.5.582. PMID 14527123. ^ Cahill et al. (2009, April). Creating partnerships to promote health and fitness in children, OT Practice, 10–13. ^ a b "Occupational Therapy Practice Framework: Domain and Process (3rd Edition)". American Journal of Occupational Therapy. 68 (Suppl. 1): S1–S48. March–April 2014. doi:10.5014/ajot.2014.682006. ^ "Occupational Therapists in Canada, 2010" (PDF). CIHI. October 2011. Retrieved May 23, 2017. ^ Robert Mcg. Thomas Jr., “Joan Erikson Is Dead at 95; Shaped Thought on Life Cycles,” New York Times obituary, August 8, 1997. Online at http://www.nytimes.com/1997/08/08/us/joan-erikson-is-dead-at-95-shaped-thought-on-life-cycles.html. ^ a b AOTA. "Children and Youth". Retrieved 19 April 2012. ^ a b Case-Smith, J. (2010). Occupational Therapy for Children. Maryland Heights, MO: Mosby/Elsevier. ^ United States Dept. of Education. "Sec. 300.34 Related services". Individuals with Disabilities Education Act. Retrieved July 25, 2018. ^ AOTA. "School-based practice". American Occupational Therapy Association. Retrieved July 25, 2018. ^ AOTA. "School-based occupational therapy". American Occupational Therapy Association. Retrieved July 25, 2018. ^ AOTA. "Occupational therapy in school settings" (PDF). American Occupational Therapy Association. Retrieved July 25, 2018. ^ a b AOTA. "Health and Wellness". ^ Brownson, C. A.; Scaffa, M. E. (2001). "Occupational therapy in the promotion of health and the prevention of disease and disability statement". American Journal of Occupational Therapy. 55 (6): 656–660. doi:10.5014/ajot.55.6.656. PMID 12959230. ^ Brown, C., Stoffel, V., & Phillip, J. (2010). Occupational Therapy in Mental Health. A Vision for Participation. FA Davis Company, Philadelphia. ^ World Health Organization. "Mental Health Atlas 2011". Retrieved 19 April 2012. ^ Cogan AM (2014). "Supporting our military families: a case for a larger role for occupational therapy in prevention and mental health care". Am J Occup Ther. 68 (4): 478–83. doi:10.5014/ajot.2014.009712. PMID 25005512. ^ American Psychiatric Association (2013). DSM V. doi:10.1176/appi.books.9780890425596. ISBN 978-0-89042-555-8. ^ Yamkovenko, S. "The emerging niche: What is next in your practice area?". Retrieved 19 April 2012. ^ Warren, M. "Occupational therapy services for persons with visual impairment" (PDF). Retrieved 19 April 2012. ^ Centers for Disease Control and Prevention. (2015)., Prevalence of disability and disability type among adults – United States, 2013. ^ Anderson, S. L. & Lehman, S. S. (2014). Treating the visual consequences of traumatic brain injury, OT Practice, 19 (20), 7-11. ^ Warren & Noble. (2016)., Occupational therapy services for persons with visual impairment, American Occupational Therapy Association Fact Sheet. ^ American Occupational Therapy Association. "Autism in Adults". ^ a b Radomski, M.V. (2008). Occupational Therapy for Physical Dysfunction (6 ed.). Baltimore, MD: Lippincott Williams & Wilkins. ^ American Occupational Therapy Association. "New Technology in Rehabilitation". Retrieved 23 April 2012. ^ American Occupational Therapy Association. "Telehealth". Retrieved 23 April 2012. ^ American Occupational Therapy Association. "Veteran and Wounded Warrior Care". Retrieved 23 April 2012. ^ "Occupational Outlook Handbook". Bureau of Labor Statistics, United States Department of Labor. 17 December 2015. ^ "Therapist Frequently Asked Questions – Sunbelt Staffing". ^ "2015 Salary & Workforce Survey". ^ Clinger, Jeff. "OT Services in Work Rehabilitation". Retrieved 19 April 2012. ^ a b c Townsend E, Wilcock AA (April 2004). "Occupational justice and client-centred practice: a dialogue in progress". Can J Occup Ther. 71 (2): 75–87. doi:10.1177/000841740407100203. PMID 15152723. ^ a b Trimboli, C (2017). "Occupational justice for asylum seeker and refugee children: Issues, effects, and action.". In Sakellariou, D; Pollard, N (eds.). Occupational therapies without borders (2 ed.). pp. 596–603. ^ a b Scaffa, M. E., & Reitz, S. M. (2013). Occupational therapy community-based practice settings. FA Davis. ^ Foster, M. (2002) "Theoretical Frameworks", In: Occupational Therapy and Physical Dysfunction, Eds. Turner, Foster & Johnson. ^ Lee, Jenica (22 June 2010). "Achieving Best Practice: A Review of Evidence Linked to Occupation-Focused Practice Models". Occupational Therapy in Health Care. 24 (3): 206–222. doi:10.3109/07380577.2010.483270. PMID 23898928. ^ "Australia". Occupationalperformance.com. Retrieved 2014-08-26. ^ Parham, L. D., & Mailloux, Z. (2010). Sensory integration. In J. Case-Smith & J. C. O’Brien (Eds. ), Occupational therapy for children (pp. 325-372). Maryland Heights, MO: Mosby Elsevier. ^ Parham, L. D., Cohn, E. S., Spitzer, S., Koomar, J. A., Miller, L. M., Burke, J. P. … Summers, C. A. (2007). Fidelity in sensory integration intervention research. American Journal of Occupational Therapy, 61, 216-227. ^ Bailliard, A. L., & Whigham, S. C. (2017). Centennial Topics—Linking neuroscience, function, and intervention: A scoping review of sensory processing and mental illness. American Journal of Occupational Therapy, 71, 7105100040. http://doi.org/10.5014/ajot.2017.024497. ^ American Occupational Therapy Association. (2008). Occupational therapy practice framework: Domain and process (2nd ed). American Journal of Occupational Therapy, 62, 625–683. ^ American Occupational Therapy Association. (2002). Occupational therapy practice framework: Domain and process. American Journal of Occupational Therapy, 56, 609–639. ^ Gray, Julie McLaughlin (12 July 2009). "Discussion of the ICIDH-2 in Relation to Occupational Therapy and Occupational Science". Scandinavian Journal of Occupational Therapy. 8 (1): 19–30. doi:10.1080/110381201300078465. ^ Stamm, Tanja; Cieza, Alarcos; Stucki, Gerold (June 2006). "Exploration of the link between conceptual occupational models and the International Classification of Functioning, Disability and Health: Answers to the comments from Norway". Australian Occupational Therapy Journal. 53 (2): 143–144. doi:10.1111/j.1440-1630.2006.00573.x. ^ Haglund, Lena; Henriksson, Chris (November 2003). "Concepts in occupational therapy in relation to the ICF". Occupational Therapy International. 10 (4): 253–268. doi:10.1002/oti.189. PMID 14647539.